Our subjects are all about making sense of the assumptions, practices, beliefs and questions that shape our lives and societies. As an undergraduate, you’ll be learning alongside students from the different courses in our School, providing you with an outstanding environment to study in. You'll graduate as a thoughtful, lively, critical and creative thinker with much to contribute to today’s complex and diverse society. You’ll have the knowledge and capacity for high-level enquiry in your subject and a wide variety of transferable skills, including teamwork and leadership. Graduates from our School go on to different career paths which highlights the different skills and opportunities that our students have. Some of our students stay at Leeds for postgraduate study and benefit from a 10% alumni tuition fee bursary. Leeds has great support for entrepreneurs and some of our graduates have launched their own successful businesses, such as Sophie Tregellis who launched her dog biscuit company whilst finishing her final year. What do Philosophy graduates do? A philosophy degree equips you with excellent communication skills, the confidence to work independently and in a team, strong research skills and the ability to interpret and analyse complex information from different sources. These transferable skills are highly attractive to employers across a number of sectors. You'll find our philosophy graduates working in many different industries including: tourism, management, business and finance, retail, recruitment, journalism, human resources, teaching, marketing and education. What do Theology and Religious Studies graduates do? You’ll have strong cultural and social awareness alongside other valuable transferable skills that will help you progress into a variety of careers. You’ll be a confident communicator, have strong research and organisational skills and be able to clearly present your views. Our graduates work in management, politics, the civil service, journalism, education, the charity sector and many more. What do History and Philosophy of Science graduates do? You’ll graduate with strong research skills, the ability to think critically about complex information from a range of sources, experience of working as part of a team to deliver on projects and strong communication skills. As a joint honours student, you'll be studying History and Philosophy of Science with another subject allowing you to develop good organisational skills, effective time management and knowledge of two subject areas. You’ll benefit from support and opportunities within the School and have access to the activities and expertise of the award-winning University Careers Centre. Our paid interns work on a range of projects in the School including communications, alumni relations, administration, student engagement and research internships. You'll be eligible to apply for the Laidlaw Scholarships which offer training, support and mentoring whilst contributing to research work at the University. Student guides help us to organise and deliver events for local schools. Being a student guide is great for your CV, particularly if you're considering a career in teaching, or interested in events management or education administration. Experts in the University’s Careers Centre will support you to make informed decisions about your career path, understand the wide range of opportunities available and the steps you need to take to pursue your choices. You’ll have regular access to a careers expert who specialises in improving and supporting the careers and employability of students in the School of Philosophy, Religion and History of Science. You’ll also be encouraged to attend on-campus events such as graduate recruitment fairs, employer networking and information sessions, and meetings with our alumni to help you understand and plan your career path. The optional study abroad year and work placement year offer valuable experiences and skills to help you in the graduate job market. Clubs and societies are a great way to get involved in many activities and explore your interests. They’re also a great way to develop your skills such as team working and leadership. You could be a key player in an award-winning sports team, or become a committee member and chair society meetings, or you could even project manage a volunteering trip overseas. The Union is also home to School Reps who are appointed by students to represent the views and be the voice of students in your School. 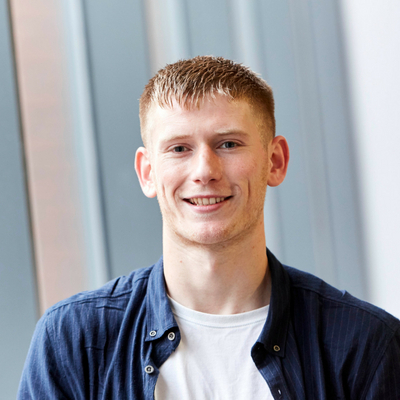 "The people-orientated setup of the course at Leeds has benefitted my ability to build open and trustful working relationships with new people at a quick pace."